I know I can’t be the only person who loves sweet potatoes. Even better, vegan stuffed sweet potatoes. A sweet potato provides you with a rich, buttery tasting sensation without the butter. Let’s consider the lowly sweet potato for just a moment. Nothing is more filling that a sweet potato. And that rich butter taste…amazing. But you may now know they are very nutritious as well. Yes, sweet potatoes are good for you. It’s hard to find a more nutritious vegan food than the sweet potato. It is one of the highest in beta-carotene. Studies have show that eating just one sweet potato can significantly raise blood levels of vitamin A. As you can see there are a lot of reasons to love the sweet potato. But my favorites reason is for it’s naturally rich butter taste! And when you stuff it with a lot of other delicious and nutritious ingredients it because an amazing vegan meal. I have assembled three different stuffed sweet potato recipes for you to try. A simple skinny stuffed sweet potato, An overstuffed sweet potato, and a cheesy broccoli stuffed sweet potato. All of them vegan and all of the delicious! 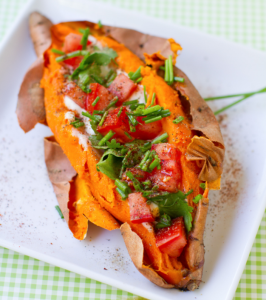 I like over stuffed sweet potato recipe the best (it’s #3) but all of them are amazing. Perfect for keeping the calories down but the nutrition and taste high! This recipe is based on the principle that it shouldn’t be just something you eat on the side. 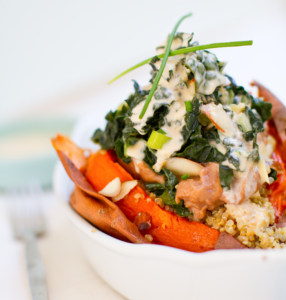 The sweet potato should be the centerpiece of the meal. Get the full recipe by clicking here. Both of the following sweet potato recipes are incredible. As I said before, my favorite is the over stuffed baked potato recipe you can find below. But you can’t go wrong with any of these delicious and filling recipes. You should also keep in mind you can mix and match, take some things out, or add new things based on what you love to eat. You can make these wonderful sweet potato recipes just as they are written and they will be great. Don’t be scared to shake things up and make them your own with your personal tweaks. I’m a big garlic fan so I tend to include it in everything, these sweet potatoes are no exception. 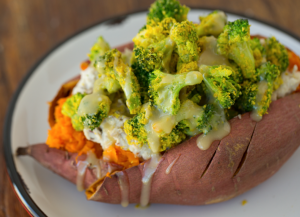 This sweet potato is loaded up with broccoli, a vegan cheese sauce and more! Two of my favorite things combined on one plate is a guaranteed winner. You can’t go wrong with this broccoli and sweet potato combination. It’s a vegan recipe to die for! Click here to get the recipe. 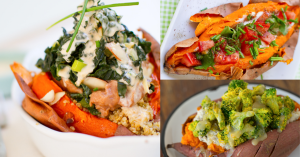 And now for my favorite of all three of these great vegan sweet potato recipes. Filled with amazing things like quinoa and sauteed mushrooms, kale salad, beans, veggies, sunflower seeds, and more! If you want to turn your mild mannered potato into a complete dinner feast beast, this is for you! I definitely saved the very best for last. If you like recipes where you throw everything you love in them except the kitchen sink, then you will fall in love with this one as well. So many amazing ingredients in the stuff sweet potato beast! Get this recipe by clicking here. It’s what’s for dinner on pickleball nights! WHAT IS THE SECRET OF BEING HAPPY AND FIT? Now u can create Fresh, Delicious, Healthy home-cooked meals quickly and easily. Made from tough and strong BPA free ABS plastic. Extremely robust design with solid Stainless steel handles built to last for years of solid use. Plus FREE CLEANING BRUSH.Brilliant for zucchini noodles and zucchini spaghetti.You can Turn firm Vegetables & Fruits into curly julienne strips. Click the Button at the Top of this Page to Protect Your Spiral cutter NOW!